It may seem like a strange time to think about outdoor entertaining — or not. If you’re in the Midwest (or Florida, considering its recent weather), you’re probably longing for warmer days spent outside (aka going to your mental “happy place”). Now, my happy place involves mostly grills, fridges, kegerators and warming drawers. Thankfully, one of my favorite kitchen designers/bloggers — Susan Serra, CKD, author of The Kitchen Designer — aided my call to fill in the blanks (my questions in bold) to my outdoor kitchen ideas. Watch for “Outdoor Kitchens: Part 2,” wherein I talk about choosing outdoor kitchen appliances. Visualizing how you will use your outdoor space will inform the design process, Serra says. 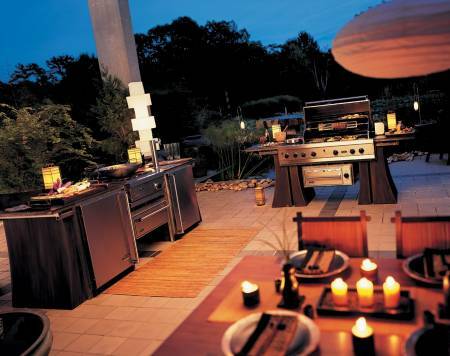 What factors should those planning an outdoor kitchen keep in mind? Outdoor kitchen size – Are you looking forward to entertaining large groups or cooking quiet, intimate dinners? Something in between? Visualize how you will use an outdoor kitchen…the frequency of use, the conveniences required, and the type of cooking (ambitious or simple) you’d like to plan for. Will others cook along with you or will one or two be responsible for outdoor cooking? Do you need separate cooking stations for prep or meal stages? Now’s the time to dream, imagine, and visualize the flow you’d love to have in your outdoor kitchen. Location – Consider the lay of the land. Can an existing deck be used? A terraced section? A gazebo to house a separate kitchen? Is the topography of the land level? How close to the house would you like the outdoor kitchen (watch out for heat/smoke/noise issues if an outdoor kitchen is desired to be just outside the house.) What other outdoor activities will impact on the location of the kitchen? Make a list of expected activities (including lounging) to be sure an important activity (Bocce ball anyone?) is not forgotten. Another factor in outdoor kitchen design is the weather. The weather will play a role in the wear of outdoor kitchen surfaces and your own desire to brave the elements while cooking up a storm! Style – Of course, this is the fun part! What is the style of your house? Of your gardens, your outdoor living space? Outdoor kitchens can be designed in any way: modern, traditional, rustic or eclectic. All elements of your outdoor room builds on one another, even as one walks into and out of the house. Be style-conscious! Appliance needs – One of today’s No. 1 hot buttons in outdoor kitchens, an explosion of outdoor appliances, tempts us to want it all: the ice machine, the beer station, the cocktail station, cooktop burners, warming drawer and so much more! Appliances are a large part of the fun of an outdoor kitchen, but consider what is really expected to be needed and used frequently. Weather is a chief concern when building an outdoor kitchen in Minnesota. What should we consider, and what advice do you have for people in other parts of the country? Midwesterners often have severe weather in each direction — very hot and very cold! Is your chosen spot sheltered from heat, cold, and wind? With spring storms racing through the Midwest, and extreme temps, consider sheltered outdoor kitchen designs for people, and sun and heat exposure protections for your materials and surfaces as well. Southerners – It’s all about shade! Consider shade cast by trees, buildings, or other structures/plantings. Note the sun’s exposure at your desired site for an outdoor kitchen. An optimum design would have the kitchen situated in a northern exposure. What time of day will the outdoor kitchen be mostly used? In a southern climate, each meal can easily be enjoyed outdoors. The sun’s path over your desired location will either be a help or a huge hindrance. Westerners – Of course, the weather in the western portion of the U.S. varies greatly from warm/temperate southern California to zone 5 in Colorado, so Westerners can take tips from other parts of the country. One difference is the much lower humidity level, which is more tolerable and will allow a southern exposure in some areas that would otherwise be prohibitive in the deep South. For certain parts of the west — given a large area to work with and a beautiful, temperate climate — you have my OK (if it works for your lifestyle) to GO LARGE, as your outdoor kitchen may well be used year-round (Southerners take note!). Easterners – The varied zones from the mid-Atlantic region to upper New England has a wide spread in temps as well. Lower to upper New England may wish to seek out western exposure (if the kitchen will be used late in the day) and southern exposure. 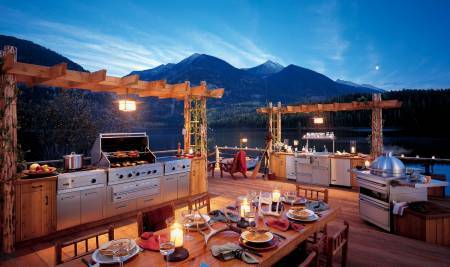 The size of the outdoor kitchen should be seriously considered due to short outdoor seasons (mountainous Westerners take note). Serra says those with expansive suburban or rural views have an opportunity to design their outdoor kitchen proportionately larger due to the scale of their great outdoors. What do you suggest for city-dwellers looking to create an outdoor kitchen space? What are your true priorities for outdoor cooking? I have family members in New York City who crave the simplest tabletop grill to put on their terrace and to serve their purpose. Many who wish to grill in an urban area are passionate cooks who want the grilled taste and texture and want to cook in a healthy way. For those people, any type of grill appliance will do! For those with a larger space, or a home in an ex-urb community with a small patch of yard, consider a larger grill or even a combination grill/burner/refrigerator appliance that has it all. Some grills have integral countertop pieces that extend. Otherwise, small tables or built-in brick columns are small but can double as counter space. What are some trends you see happening in outdoor kitchens? Choosing environmentally friendly materials in outdoor kitchen design is a strong movement, but one must look for durability as well. Energy efficiency in appliances is ever-progressing. Pinpoint cooking technology in appliances offers the same control as the best in-home appliances do. The style of outdoor kitchens now is a warm, soft, natural look — perhaps rustic, perhaps modern with clean lines, but connected to the style of the outdoor room in a natural, organic way. How do you feel about including a sink or faucet into an outdoor kitchen? Having a sink in an outdoor kitchen is one of the best elements one can design into an outdoor kitchen! The sink handles prep, cooking, entertaining and cleaning tasks and is ready for duty exactly when needed. Outdoor plumbing takes on a whole new meaning when considering where and how to plumb a sink. Do you need hot water at the sink for cleaning? Consider a small undercounter water heater. A shut-off valve is a must to drain the system before the winter. A stainless steel sink is a natural choice, but cast iron has good looks and durability. Just cover the sink to avoid a home/play area for small animals! And, stone sinks are definitely a natural! Faucets serving multiple functions may be useful and most durable in a tall gooseneck style — perhaps in stainless steel, with a simple design to withstand the elements and keep its good looks. Do certain metal finishes (i.e. chrome, nickel, bronze, etc.) work best outdoors? I’m a believer in mixing metal finishes. I would not recommend mixing metal finishes with abandon, as the balance and proportion of the colors and finishes within the kitchen as a whole should be thought through. Can you mix a black or dark brown/bronze faucet with a stainless sink? In some cases (sink surrounding a speckled granite countertop for example), YES. Look at other metal finishes such as lighting, metal furniture and other finishes for a guide. In my view, mixed finishes make for the most natural of interior or exterior rooms. But — as with any other designed area — it has to make sense in the context of color, texture, proportion and balance. That said, have fun experimenting and exploring your vision, definitely! I think yours frustration is a common motivator for those deciding to build an outdoor kitchen. I’ll e-mail you and we can chat. Great information! Thanks for sharing this outdoor kitchen designs. Outdoor entertainment is the key to keeping your house from being wrecked…LOL. Seriously though, keeping the mess outside is key to saving your furniture and precious belongings. Here is South Africa we have a great outdoor entertainment tradition, with the braai (BBQ) being a national passtime. Wooden decks are really popular, especially for extending entertainment areas. Then we have what is called a lapa (pronounced lah-pah) with a built in BBQ, thatch roof and seating area, usually adjacent to a swimming pool. Our summers are glorious throughout the country, and snow in winter is unheard of, so our outdoor tradition is huge. Sheila, that sounds amazing. Here in MN, some keep the outdoor BBQ tradition going into the snowy months, grilling meat for holidays (bundled up in a parka, no doubt). Thanks for sharing.